Flyover country. That is our label, no matter how many awards we win in Minneapolis for cleanest city or best place to raise a family or number of live theaters per capita. We can change our national perception if we can send someone to Real Estate Connect in San Francisco. That is our 50-word response to a contest being put on via blog by The Real Estate Tomato to obtain a free ticket to Inman's Real Estate Connect being held in San Francisco at the luxurious Palace Hotel from August 5 to 7. If we win a free ticket, it will be a victory for educational advancement in the country's belly section. Reminder: Even if we don't win a free ticket, you can attend Inman Real Estate Connect at half price through a MAAR special because our illustrious CEO, Mark Allen, will be a panelist at the event. Click here to learn more. We've all had a few days to think about the impact of the Housing and Economic Recovery Act of 2008 signed by the President. Like almost all major legislation, it has provisions to satisfy or annoy everybody—buyers, sellers, REALTORS®, lenders, government regulators and real estate markets in general. Most comments I‘ve heard from members or read about in numerous publications relate to the new first-time buyer tax credit or the elimination of seller-funded downpayment assistance programs. The first-time homebuyer provision is in truth a loan repayable over 15 years. If the property is sold again within 15 years, the remainder of the credit must be repaid at tax time. The credit is equal to 10% of the cost of the home, not to exceed $7,500. It may be used for any single family property that will be used as a principal residence. A tax credit reduces income tax liability on a dollar-for-dollar basis. For example, when my income taxes are prepared for the year, I buy a qualifying property, and I owe $1,000. When the tax credit is applied, I receive a payment of $6,500 from the government (based on the maximum credit of $7,500). The full amount of the credit is available for individuals with adjusted gross income of $75,000 or less ($150,000 on joint return). The purchaser and spouse may not have owned a principal residence in the three previous years to qualify. The home must be purchased between April 9, 2008 and July 1, 2009. This provision is an incentive for homebuyers waiting for even better deals to get off the sidelines and back into the housing market. The Act also prohibits seller funded downpayment assistance or assistance from someone who financially benefits from the transaction, effective October 1, 2008. Legislation has already been introduced in Congress to overturn this provision. Its outcome is uncertain at this early date. Assistance from family members, government-sponsored programs or gifts from nonprofits will still be allowed. If you listened to 89.3 The Current anytime in April or May, you likely heard this: "Everyone knows the mortgage market is in crisis and that it's dragging down the rest of the economy. But what caused it? How can we get out of it? And how can homeowners and potential buyers in Minnesota protect themselves?" That was the call to action for a May 15 "casual gath" at the Varsity Theater in Dinkytown called "Policy and a Pint," a periodic event cohosted by the Citizens League and 89.3 The Current that involves yummy appetizers, comfortable couches, and, yes, beer. I had a pint of Grain Belt Premium. Richard Todd from the Federal Reserve and personal finance writer Kara McGuire from the Star Tribune were on hand, and the event was moderated by 89.3 The Current DJ Steve Seel. "There just isn't one story," he said. McGuire backed up that notion with a funny little foray into blame gaming. She pulled out a sheet of paper and rattled off a list that included mortgage brokers, the lending industry, Wall Street, rating agencies (Moody's, The Fed), regulators, and the buyers themselves (as part of "irrational exuberance"). Kara called today's situation an "ugly cocktail of events." 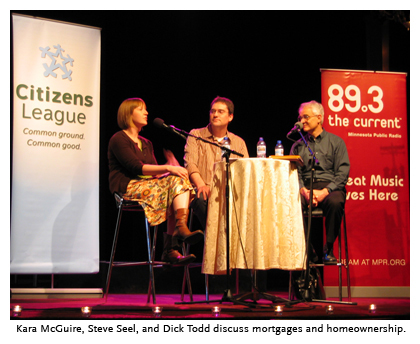 The event was titled "The Mortgage Meltdown" so lending was the primary topic of the day. There was some foundation-laying talk about adjustable rate mortgages, Fannie Mae, Freddie Mac, credit scores, and foreclosure. Todd, again, offered a learned voice to the cyclical nature of homeownership and pricing. It was noted that people in the mortgage industry expect to see an explosion in FHA loans, maybe because these loans don't look so closely at credit scores. All the same, folks can now expect 5 to 10 percent down and proof of viable employment to be the norm. With home prices still not in the same ballpark as incomes for a lot of metro residents, even 5 percent could be a problem. Why are buyers waiting to take advantage of this incredible buyer's market? Maybe they aren't waiting. Maybe they simply don't have the money. A down economy means a down economy, yo, and sometimes a $600 economic stimulus check represents just a month of gas and groceries, not the earnest money for an offer on a new home. How come someone who can't afford their $150K home gets pushed into foreclosure by a spiking ARM and then the bank turns around and sells to someone else for $50K? Why not just restructure the loan rather than allowing this emotional and financial loss? The answer is complex, of course, but the basic reasoning is because many banks believe they would just be extending the inevitable for the homeowner in trouble. If they got into the mess in the first place, they are likely to do so again. Still, loan modification products are out there and may see an increase if the foreclosure numbers continue to head upwards beyond basic irresponsibility. The rental market came into question as one attendee noted that his rent just went up $100. "It's important to maintain a healthy renter market," said Todd. There is, however, a feeling that rents are on the way up as more people seem to be remaining in rentals, whether by choice or force of market. It was suggested that we can expect to see a return to favor of contract-for-deed and rent-to-own arrangements. There was an event afterparty hosted by the Citizens League at the Loring Pasta Bar in a private room on the second floor. I had a Fat Tire, talked to some PR people and some homeowners, and, overall, had a much better time than I thought I would. More on that tomorrow. Updated every Monday with the latest activity from the Twin Cities housing market. A quick and easy monthly look at the Twin Cities housing market. A look at the supply of homes for sale and absorption rates in the Twin Cities by price range, property type and construction status. Monthly housing activity updates for more than 350 cities in the Twin Cities metropolitan area. The definitive annual housing market report of sales and price trends, historical data and commentary for the entire Minneapolis–Saint Paul metropolitan area. An interactive market analytics tool from 10K Research and Marketing, a division of the Minneapolis Area Association of REALTORS®. Updated nightly.